At its best, networking is all about creating and strengthening genuine human connections. Yes, it’s a means to advance your career and search for jobs, but networking can also provide a platform for peer learning, a source of candid advice, and a space for professional camaraderie. Once you start incorporating simple networking habits into your life, it will seem more like a natural extension of your professional routine. Read on for six key strategies you can use to bolster your network and build connections, compiled by the Campbell & Company Executive Search team. Keep in touch with former colleagues and connections. Networking is very much about expanding your professional footprint—but it’s just as much about maintaining your established relationships. This means former co-workers, supervisors, and also people you knew in other professional capacities. Perhaps you served together on a volunteer committee or collaborated through an umbrella organization. Whatever the original tie, if you had a relationship worth maintaining, put some work into staying in touch. We recommend making a list of around 10-15 people who you plan to reach out to on a semi-regular basis. This outreach doesn’t have to be time-consuming or elaborate. A simple (but personalized) email or LinkedIn message will do the trick. So will a coffee meetup if you still live in the same city or a quick note sent through the mail. Make a point to follow updates they share on social media so you can leave a thoughtful comment or congratulations for big life events. If you come across an article that may interest them, send it their way with a short message. Strive to reach out at least two to three times a year to keep these relationships fresh. 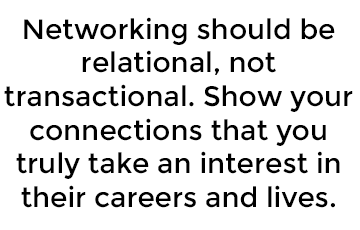 And remember: networking should be relational, not transactional. Show your connections that you truly take an interest in their careers and their lives, not just in what they can do for you. Make the most of in-person events. You probably associate networking with mingling at an after-work event, nametag on and drink in hand. This classic form of networking may feel like a necessary evil, but it’s all in how you approach the opportunity. Before you walk into the event, be prepared with a strategy for how you’re going to “work the room.” If you’re particularly nervous, it can be helpful to invite a colleague or friend to join you at the event. Moving through the room and holding conversations is often easier in pairs. If you need to attend by yourself, remember that getting out of your comfort zone is a critical part of networking. Try to embrace it. Whether you plan to attend with a colleague or on your own, be sure to have a conversation starter ready. Something as simple as “What brought you to this event?” or “Are you looking forward to tonight’s speaker?” can do the job. As you try various openers, you’ll figure out what feels most natural for you. Finally, give yourself a goal or two for the event. Maybe you plan to speak with at least five people in your field or you want to connect with a specific leader while there. Whatever your objective, identifying it will make the event feel more manageable. After the event, remember to follow up with people you met, whether through a LinkedIn connection, an email, or a note card. A final note: Not all in-person events are created equal. Don’t let a single bad event stop you from attending others that are organized by a different group. Networking is first and foremost a habit. It takes repetition! Build a robust professional presence online. These days, online engagement should be a large part of your networking strategy. LinkedIn is the obvious forum—my colleague Joey Scheiber wrote a helpful article on creating a strong LinkedIn profile—but you may also have opportunities on Facebook, Twitter, or another social networking site. Taking some time to scroll through feeds, comment, and remain active in affinity groups can be a perfect way to network for the busy nonprofit professional. We suggest using work anniversaries on LinkedIn as a way to keep in touch with past colleagues and connections. As you work to build your online presence, be sure that whatever messages you send or actions you take reflect your personal brand and come off as genuine. You want to project a professional presence in every email, comment, “like,” and retweet. In many ways, a mentorship is the holy grail of networking. A relationship with a mentor should be substantive and long term. Good mentors will provide guidance, field questions, facilitate connections, and ultimately help with career advancement. So where can you find a mentor? As you network, keep an eye out for people you naturally connect with and whose careers you admire. They don’t have to be in a position that you aspire to; they simply have to be someone you wish to learn from. They might be a leader in your organization, an active volunteer in a professional organization you’re involved with, or someone who you’ve never even met. Don’t be afraid to reach out and ask your prospective mentor to grab a cup of coffee or talk on the phone. Let them know you’re interested in hearing about their career and learning from them. Mentoring is a two-way street. As a mentee, practice active listening, express gratitude, and pay it forward when you can. Be open to mentoring someone else who is earlier in their career. Having multiple mentors can be especially beneficial. One mentor may have followed your chosen career trajectory, while another may be in a completely different field. Being exposed to many different perspectives can be an invaluable experience. Mentorships can take many forms. Some mentorships are organized by your employer, while others are built on your own initiative. With certain mentors, you’ll communicate a few times a year over the phone. With others, you’ll meet in person regularly. There’s no one right way to mentor. As a mentee, be sure you stay open to learning from your mentor, always ask questions, and, above all, respect their time. Consider joining a professional association or affinity group. Getting involved in a professional association is one of the most straightforward ways to expand your network. You’ll meet people with similar goals, navigating similar careers, and facing similar challenges. These types of groups provide a platform for learning, teaching, and strengthening relationships. Don’t limit yourself to one group if you’re interested in joining multiple associations. For instance, if you’re a fundraiser, you may join AFP, but you also may become a member of a group more narrowly focused on your sector or cause area. These memberships can provide you with unique networking opportunities and broaden your perspective. Once you join, immerse yourself on a substantive level. Volunteer on a committee that interests you and engage with people at different levels of their careers. Professional associations are a great place to meet a mentor and get to know movers and shakers in your field. Get involved in your community and leverage personal ties—as appropriate. As a nonprofit professional, you’re already mission-driven and you likely enjoy volunteering. But do you think of your board work and other service activity as a networking opportunity? Volunteering is a natural way to extend your network; you have a built-in shared interest with other volunteers. There are so many other reasons to volunteer than to build up your professional network (giving back, living your values, making friends) and that’s what makes it such an enjoyable approach. Leveraging personal ties is another natural but often overlooked networking avenue. Do you have a friend of a friend who you admire professionally? An acquaintance who works for an organization you respect? Go ahead and start a conversation—just be sure you’re not overstepping. Instead of asking for something explicitly, open up a dialogue to learn more. 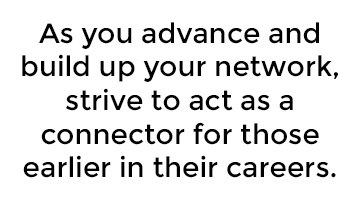 As you advance and build up your network, strive to act as a connector for those earlier in their careers. Not every networking tactic will work perfectly every time, but it’s important to put yourself out there to grow as a nonprofit professional—whether you’re new to the social sector or a 30-year veteran. If you have questions about networking or other professional development topics, don’t hesitate to leave a comment or contact me directly. Colleen Rogers is a Consultant in the Executive Search division of Campbell & Company. She takes a candid approach to understanding client cultures and the positions at hand by listening to staff members and decision-makers, asking key questions, and getting to know everyone involved in the search process.